Lingti is a little known valley in eastern Spiti in Himachal Pradesh. The valley is bound from all sides by high Himalayan peaks and ridges. To the north is the massive Gya peak (6794m); the highest in Himachal Pradesh. Gya Peak is at the tri-junction of Ladakh, Tibet and Spiti. From Lingti valley, towards North-east across the ridge connecting Gya with Shijibang (5990m) peaks is Tibet. To the North-west across the ridge connecting Gya and Parilungbi (6166m) peaks is Ladakh. To the west and south the valley is bounded by the ridge-line connecting Parilungbi-Lakhang (6250m)-Shilla (6132m) -Cho-cho Khang Nilda (6380m)-Tserip (5974m) and Kuwa (6008) peaks. Lingti itself is born out of the massive glacier at the feet of Parilungbi. The river initially flows south east for about 20km where it meets another branch called the Chaksachan Lungba (river) coming from north. The Chaksachen lungba is born from the glaciers of Gya. Lingti then bends sharp 90° and flows south-west. Before exiting the gorge it is joined by the Syarma nala from west. It then carves a narrow gorge cutting the Sisbang ridge and the Cho-cho Khang Nilda ridge and flows out to join the Spiti River at a point almost opposite to the junction of the Spiti and Pin rivers. ‘Lingti’ is an instrument that cuts rock, as it literally means in Spitian. The rapidly flowing white water of the glacial melt has carved a deep gorge through an otherwise rolling steppe landscape, thus probably the name. The river cuts a narrow gorge with towering rock faces along both banks. These rocky steep banks rise up, almost near vertical, until it reaches the edge of the plateau. Here the valley suddenly opens up into a flat dish of rolling hills. The plateau stretches in all directions until it approaches the ridge-line fence created by the mountains all around the valley. Here the rolling hills immediately start rising and turn into massive rock and ice slopes leading to the top of the various mountains peaks and ridges. Lingti valley is surely a mountaineers paradise. But due to the remoteness of this valley few mountaineers venture here. 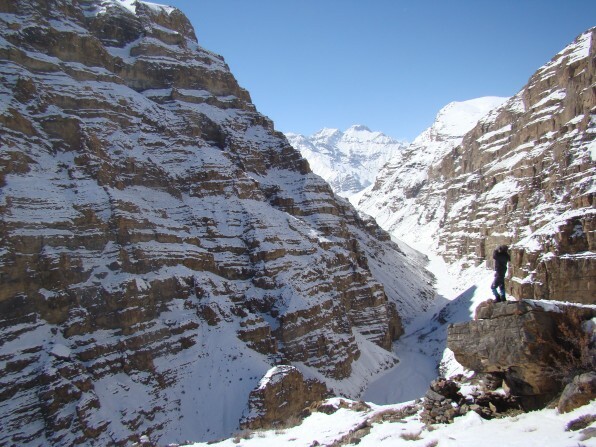 The first outsiders to visit this valley was an expedition led by Harish Kapadia in 1983. They managed to penetrate the valley halfway and then turned their attention towards Cho-cho Khang Nilda and surrounding peaks. The same expedition returned in 1987 and managed to reach the source of Lingti and even climb Parilungbi. Since then hardly any expeditions have come this way. Recently Gya was climbed from this side by another Indian expedition, but overall very few have made it this far. At the same time Lingti is a geologist’s goldmine too. It is a living museum that has preserved over 250 million years of geological history in the form of shales and fossils. The ammonite and belemnite fossils from here are known world over. Many theories are based on the geological studies carried out here. Fossils collected by Dr. Richard Hey in 1955 are still preserved at the Sedgwick Museum in Cambridge. 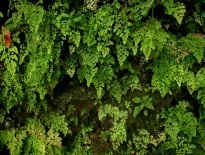 But, little was know about the wildlife of this remote valley until very recently. Till the last decade most of our knowledge about the wildlife of this valley came from the anecdotes reported by adventurers and mountaineers who visited this area. In mid 1980’s this valley was notified as part of the Kibber Wildlife Sanctuary. This region is so remote that there is not a single village in about 400 km2 of the upper habitable part of this valley. Historically there was a village called ‘Uhlshikpo’ within this valley, which moved out due to its remoteness around 80-100 years ago. Now only the ruins of ‘Uhlshikpo remain inside the valley. Although this valley is along the border with Tibet there are no passes crossing from Lingti to Tibet and so this region has received relatively little attention from Army or the Border Police Force, except for some routine patrols. Last year, I got the opportunity to survey this hidden valley and prepare a plan for the management of this valley for the conservation of its wildlife wealth. This exercise was a part of the collaborative effort between Himachal Pradesh Forest Department and Nature Conservation Foundation on Management planning of the region. The task had to begin from documenting what wildlife existed inside Lingti, then assessing its status and recommending suitable interventions for its long-term survival. This survey was to be a tough challenge. Along with difficult terrain there was also the thunderous rock cutting river torrent. To get into Lingti one requires crossing the river many times. It meant that for any kind of survey we had to wait till the water was at its lowest. I decided to attempt this in late autumn and early winter. At the beginning of winter the water level in the river goes down and ice bridges are formed all across the river making the river crossing relatively easier. But, the early winter cold makes camping in the open a miserable experience. I needed a tough team for this kind of a survey. The members not only had to be physically extremely fit but also knowledgeable about conducting wildlife surveys. They had to be able to identify animals based on their signs such as droppings and spoors (footprints in soft soil or snow) and be able to use technical equipment such as Global Positioning System (GPS). I found such knowledgeable and fit people in the Kibber Youth Council. The Kibber Youth Council had been helping us (Nature Conservation Foundation) with wildlife conservation programs in the main Spiti valley for over ten years. The team members were Sushil, Kalzang, Thillay, Kalzang Pulzor, Chudim, Rinchen, Sheru, Thukten and myself. 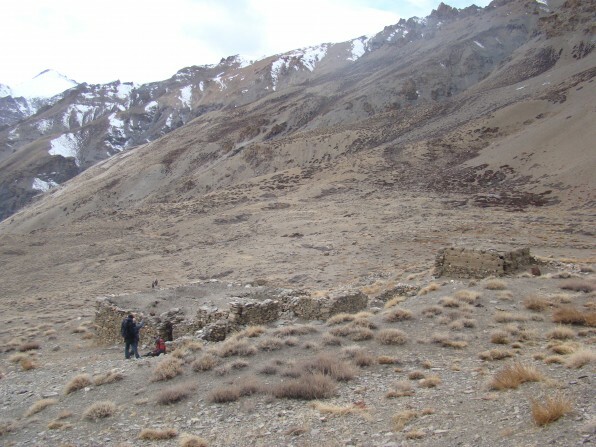 We began our survey from Lalung (3776m); a village located very close to the confluence of Lingti and Spiti. With a population of about 370 people and 55 houses Lalung is a largish village by Spitian Standard. 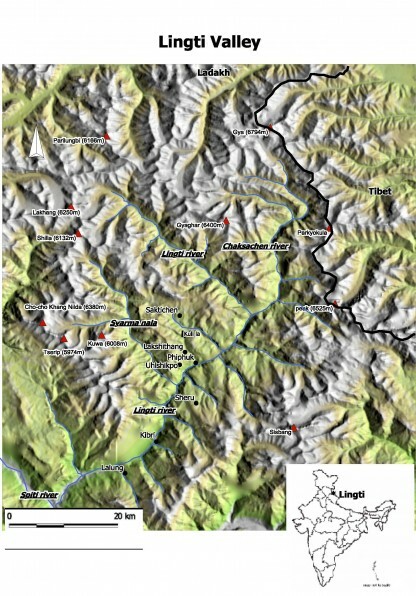 I wasn’t surprised to know that very few people from this village had ever been inside the Lingti Valley. As metal roads and electricity penetrated deep into the mountains and reached this village, their lifestyle changed dramatically. People became more market dependent; selling their crop of pea and buying the grocery from stores in Kaza (the administrative headquarter of Spiti) became the norm of life. No more is there a need for them to go deep inside Lingti valley to graze their livestock or find wood to make the plough or building. While we heard tales of snow leopards and blue sheep from the valley we got little credible information. It was time for the actual survey. Thukten II the herder from Lalung was hired as our guide. 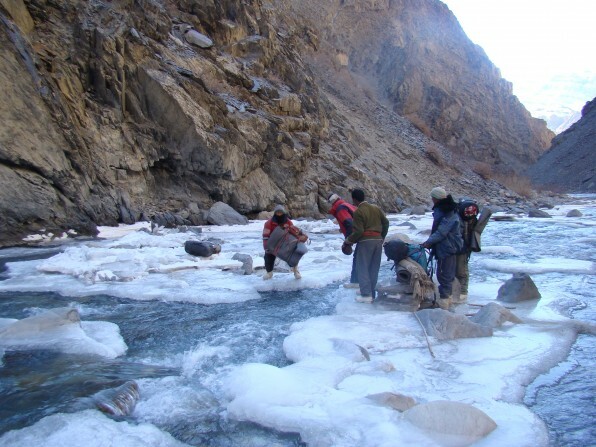 The trek to Phiphuk, the center of the valley, was arduous; we kept walking over the frozen bed of the Lingti but occasionally the ice sheet under our feet became too thin for comfort and we had to hop from one boulder to another. 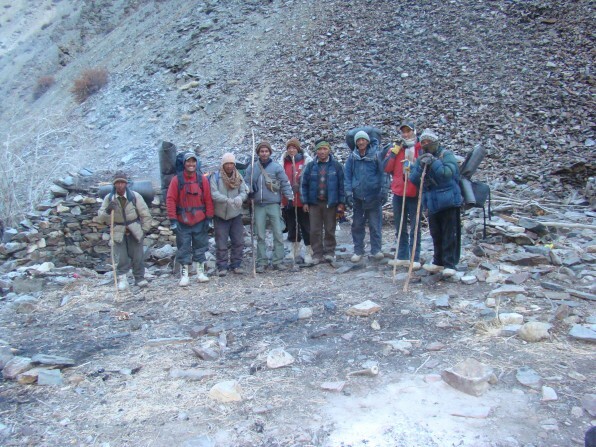 At the same time, all of us were top heavy, carrying ration for 15 days of stay and thus progress was extremely slow. The first day we camped at Kibri. Before the last light of the day our spirits were rejuvenated as we spotted a herd of 20 blue sheep grazing on the steep banks nearby. The second day of trek was full of excitement as we kept encountering fresh snow leopard pugmarks all along the trail. We kept expecting a surprise at every bend in the trail. That evening we reached ‘Phiphuk’ (4005m). We decided to make this our base camp due to its central location in the valley. This was to be our home for the next two weeks. The prospects seemed very promising; we had seen many snow leopard signs around the base-camp itself and even sighted a few blue sheep nearby. Over the next few days we split into three teams of three each and systematically surveyed every side valley and plateau. The first couple of days our team comprising of Sushil, Kalzang Pulzor and myself surveyed the areas around Lakshithang (4560m) and Saktichen (4530m). 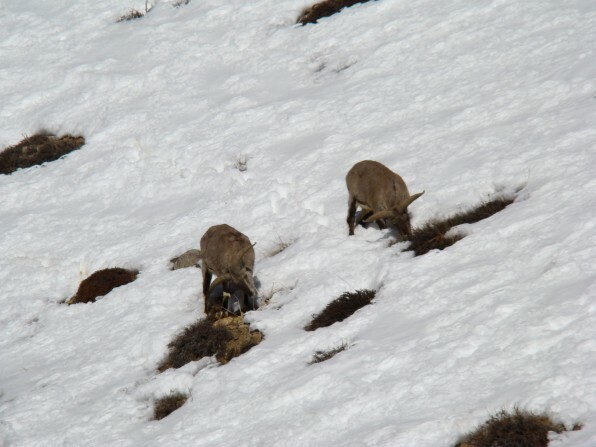 During these days we would cross the Kuli la (4880m) every day to reach the survey area but it was worth the effort as we encountered over 100 blue sheep in this region. We surveyed the area up to Chaksachen La (5230m) beyond this we knew that the habitat was not very conducive for any mammal. While our team toiled up to Kuli la-Saktichen and back every day other teams fought their way to high pastures of Sheru (4500m), ‘Uhlshipo ruins’ and Syarma la (4767m). During the day all three teams would head out with GPS and notebook in hand but come evening we would huddle together in the tiny camp and share the days experience. The tiny camp and the huddling helped us stay warm. The last area to be surveyed was the Syarma nala. We decided to survey it on our way back. The day we wrapped up from Phiphuk our team broke camp early and headed for Syarma nala. We had the huge task of covering the whole Syarma nala in one day. Effectively it meant walking over 35 km in a day. The distance felt even longer in the thin air and cold at that altitude. By evening we were proud of what we had done. We had surveyed the whole area and confirmed the presence of at least 108 blue sheep in that area. But the biggest prize of the day was to encounter pugmarks of a mother and cub snow leopard. Late evening the three of us reached the place that the others had chosen for the days camp. It was a tiny cave along the frozen river and a little sand bank separating the river from the cave mouth. Tired with a hard days work Sushil, Kalzang and me were the first to get into our sleeping bags. But soon the tiny cave became suffocating and claustrophobic; partly because there were ten of us trying to squeeze inside the tiny cave. Finally Sushil and I gave up; we picked up our sleeping bags and came under the stars on the sand bank. The sky was clear and the night extremely cold. We spread our sleeping bags next to the frozen river and tried to sleep. It was the coldest night of my life. I dozed on and off but couldn’t sleep. I watched the stars drift by softly. ‘Cygnus’ – The Swan, ‘Pegasus’, ‘Andromeda’, ‘Taurus’-The Bull, ‘Orion’-the Hunter all the star constellations passed by slowly. I kept wishing that a snow leopard would pass by but even if it did I wouldn’t have seen it in the dark. And then there was a faint glow in the eastern sky. While it was still soft glow Kalzang brew some tea. We all sat around the cooking fire huddled together discussing the night. When suddenly we heard a movement. All of strained our eye to see what made the sound; secretly wishing it to be a snow leopard. It was a stone marten, a great sighting nevertheless. In fact all of us had seen the snow leopard more number of times than a stone marten. Although stone martens are common in other parts of the world they are relatively rare here. It was only my second time. A great farewell from Lingti. The next day we came back to Lalung. During the survey, together we encountered hundreds of snow leopard pugmarks, scrapes and feces. Based on the signs, we cannot estimate the number of snow leopards but we could conclusively say that there was a healthy population of snow leopards in the valley. Also there seemed to be a healthy prey base for the snow leopard based on the good population of the blue sheep. We encountered over 350 blue sheep (counted without repetition). 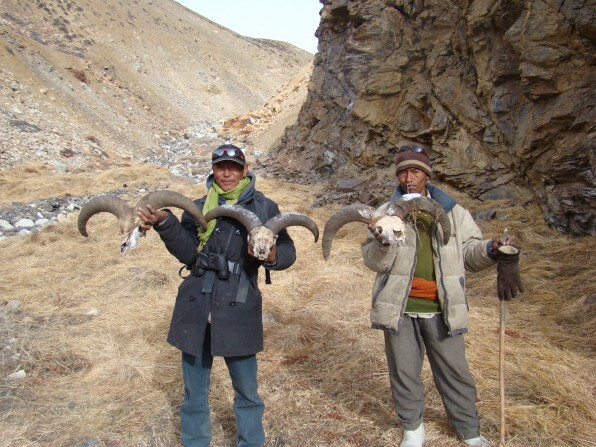 We also came across more than 10 carcasses of blue sheep killed by snow leopards. Throughout the survey we never encountered signs of Tibetan wolves. Although a few people from Lalung said that they had, in the past, seen wolves inside the Lingti Valley, I was skeptical of these reports as the habitat in much of Lingti is not suitable for an open country species such as wolf. 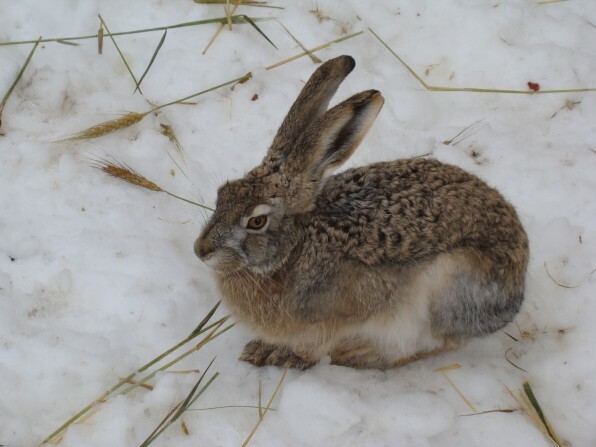 Apart from a healthy prey-predator system (snow leopard-blue sheep) we also encountered other smaller mammals such as the red fox, woolly hare, pika and the very rare stone marten. The survey information and our interaction with the villagers of Lalung formed the core of the management plan for this region. Lingti promises to be the long-term future for the survival of the snow leopard and other rare wildlife of the high Himalaya. The villagers of Lalung also take pride in being the guardians of Lingti. All throughout it was a satisfying experience to unfold the mysteries of the Lingti Valley. Nice article Kullu. It is really nice to read about that beautiful place…and to read about it from a person who obviously cherishes every minute spent there. Do you have a picture of the stone marten? Wah! Wah! Kullu Saab. Nice article and super pictures. Keep writing. Wonderful article, Kullu! That photo of orion – source? yours? Divya I haven’t managed to photograph a stone marten yet. 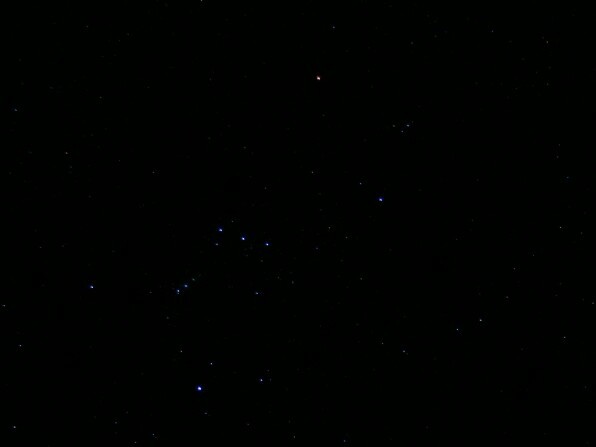 Prashanth Yes the Orion photo is mine. It was taken the next day from the warm comfort of a camp.